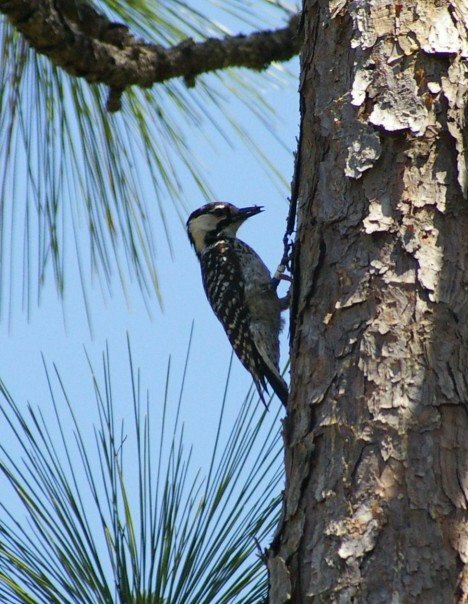 Red-cockaded Woodpecker in Croatan Forest. Photograph by Andrew David Thaler. The wet, temperate understory of a longleaf pine savanna, is not the first place one would thing to search for some of nature’s most fearsome predators. These maritime ecosystems stretch down the Atlantic seaboard, from southern Virginia to northern Georgia, but are most common in North and South Carolina. Boomerang-shaped bays, called Carolina bays, formed behind ancient sand dunes, provide the foundation for these biodiversity rich regions. More than 50 endangered species are native to the Carolina lonfleaf pine savannas, including the Cape Fear Threetoothed land snail and the iconic Red-cockaded Woodpecker, but among the most evocative inhabitants of these pocosin wild-lands are the many-jawed monsters of the the understory – the Venus Flytrap. North Carolina is a hotspot for carnivorous plant biodiversity. Dozen of species are native to it’s forests and wetlands, some found no where else in the world. Among the most common are pitcher plants, sundews, trumpets, butterworts, and, of course, the Venus flytrap. A collection of common NC carnivorous plants can be found here. The Venus flytrap is an exquisite deception, an aggregate of biochemical, electric, and passive elastic components with a single purpose: to kill. A specialized leaf grows into a two-part blade, hinged in the middle. Each blade half is held taut with a distinctive outward curvature—think of a tennis ball sliced nearly in half, and each side pushed inside out. An insect—ant, beetle, spider, fly—scents an array of nectar glands whose glistening secretions line the edge of this snare, and investigates. The bug brushes against modified plant hairs, which send an electrical impulse through the leaf at a speed of some 10 centimeters per second. Almost instantly, the plant responds, flooding elongated cells on the outer face of those inside-out leaves, and stressing their concave geometry. Pushed beyond its limit of stability, the leaf trap snaps shut, closing in less than one-tenth of a second. The hapless bug is pinned inside a tooth-fringed, bean-shaped pouch, thrashing in its verdant prison, where plant glands gush digestive enzymes. Carnivorous plants face many threats, including habitat loss, but their number one threat is poaching. Carnivorous plants are prized in the rare and exotic plant trade, and poachers have been caught trying to smuggle literally thousands of Venus flytraps out of protected areas. Enforcement is limited and many people are unaware that the flytraps they buy from home and garden centers may have been acquired illegally from some of the most threatened plant populations in the country.